We had not the best time cycling and climbing in Villach. This is not necessary due to the climbing spot, but Simon was sick during our time and the weather was also too hot. The lake ‘Faaker See’ is situated beautifully between mountains and the climbing area Kanzianiberg is well known and offers lots of routes. Unfortunately, we had a few hard days of cycling before we reached Villach and we were pretty tired. In addition, we had not too much time in Villach, so we only spent two days climbing there. This is not enough to experience the full potential of this place and our rating might be not too precise. Another interesting climbing area close by is the ‘Millstättersee’, where you can climb directly above the water. The belayer even stands on a floating wooden platform. See more about this area in our blog post about Austria. Rock and routes: We have to admit, that we were not too impressed with the routes. As it was very hot, we had to choose routes in the shade and some of them were rather polished. The rock quality was good and the walls are mostly vertical to slightly overhanging. 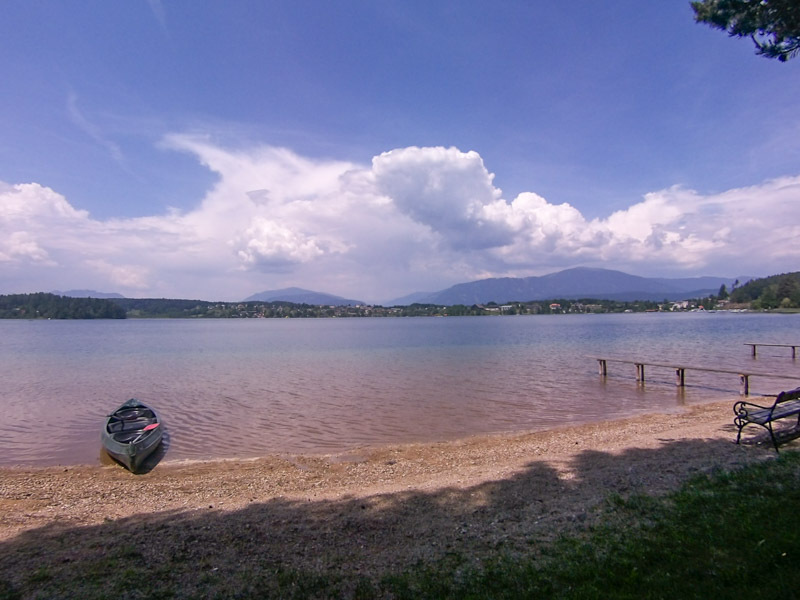 Climbing area and environment: The area around is very nice, especially the lake Faaker See. This is a perfect cool down after a hot day climbing. The mountains around are the cherry on top. Guide book and information: As we had only copies from an old guidebook, it was hard to find the routes. But we guess that a newer and better guidebook should exist for this area? Everything between UIAA 3 and 10, so good for beginners and pros. However, the majority of routes is above 6b. It gets really hot in summer (at least when we were there) and winter might be too cold. That means spring and autumn are the perfect seasons. 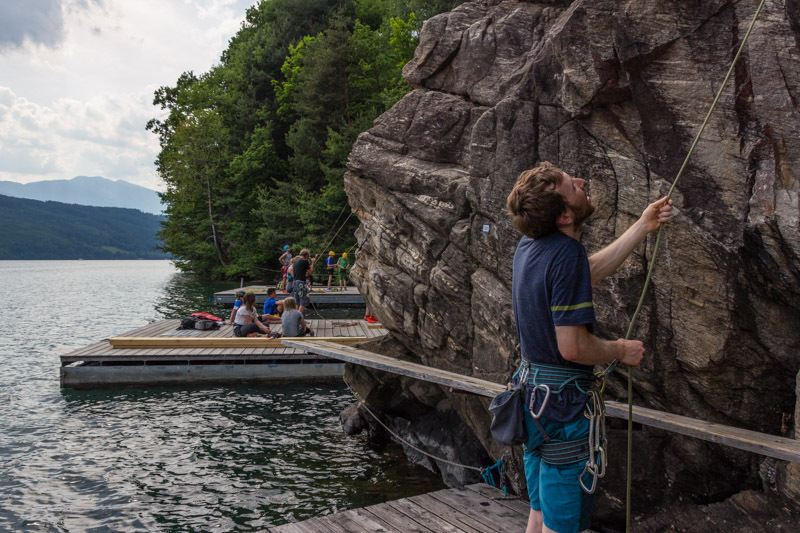 The climbing area at lake ‘Millstättersee’ is another very interesting climbing area close to Villach. Accommodation: We stayed at the lake ‘Faaker See’ at the campsite ‘Camping Poglitsch’ (http://www.kindercamping.at). It is very quiet and provides everything, even free canoes to rent. However, the price of 23€ for 2 people and one tent is not cheap. Access to food: Next to the campsite is a small supermarket, which has most stuff. Access to water: Running water at the campsite and at the climbing spot. Access by bike: The climbing area and the campsite are not too close together . It is doable, but the way is about 5 km long and 100 m up.